- Sauté celery and onion in butter in a covered pan, and let cool. - Mix together the cooked celery, onion, bread, egg and spices. - Stuff the duck with the celery mixture. Tie wings and legs. Place the duck in a roasting pan and baste with oil, arranging the neck and gizzard around the duck. 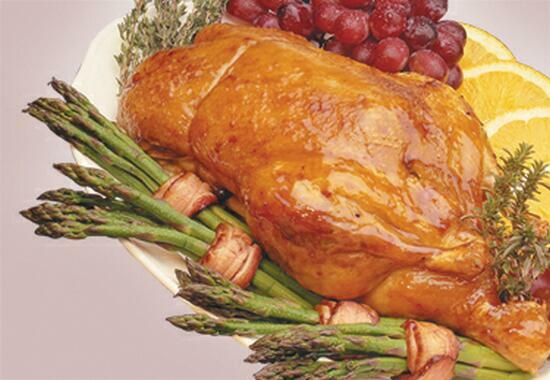 - Preheat the oven to 375°F (190°C) and roast for 1 1/2 hours, basting with drippings every 20 minutes. - Thirty minutes before cooking is done, add the mire-poix (chopped onions, celery and carrots). skim the fat, and deglaze the roasting pan using the cider. Add the poultry stock, and cook for 20-30 minutes. - Strain sauce through a sieve and serve hot over the duck.